Few companies can afford operational disruption, yet IT budgets remain flat and can’t encompass the growing need for additional resiliency measures to protect critical-business applications. 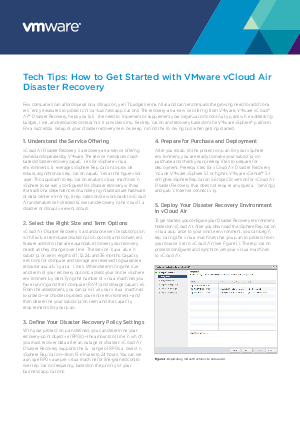 The recovery-as-a-service offering from VMware, VMware vCloud® Air™ Disaster Recovery, helps you fulfill the need to implement or supplement your organization’s continuity plans while addressing budget, time, and resources constraints. It provides simplified replication and recovery based on the VMware vSphere® platform. For a successful setup of your disaster recovery service, keep in mind the following tips when getting started.